Congratulations Tim Stepeck SDSA, winner - HOUSE OF LIES Outstanding Art Direction For A Contemporary Program (half-hour or less) and to all the nominees and winners at the 66th Emmy® Awards! See Tim's work, below. The reaction to the first season of this online, binge-viewable series in which all chapters/episodes are presented on one day was greatly focused on the format and delivery. However, this was all pro forma by the second season, so proper consideration was given by critics and viewers alike to the faultless, on-the-mark sets that give credence to the deep cynicism and extreme maneuvering of the characters, the key players in the nation’s governance. This is a Washington as slick, crisp and controlled as the manipulators running it…a tour de force on many levels! Photo © 2014 Netflix. All rights reserved. The depiction of life in the hollers of Harlan County, Kentucky has been so realistic over the past four seasons that it has deservedly garnered Emmy nominations. Season 5 proved the team could stretch beyond the geographical borders and still amaze! Thus, Raylan spent time in the swamplands of Florida, then in Memphis, and back home at the mansion of a mob accountant, while his nemesisBoyd, trying to regain his stranglehold on the Harlan heroin market, went into the dark heart of the collapsing Detroit Mob and to the cordoned estate of a Mexican drug cartel! Photo © 2014 FX. All rights reserved. With a season that began with, “In the wake of Bill's blood-soaked reincarnation…” we knew there would again be extensive new Emmy-caliber sets for the ongoing vampire/faerie/shapeshifter/wolfmen/human saga! 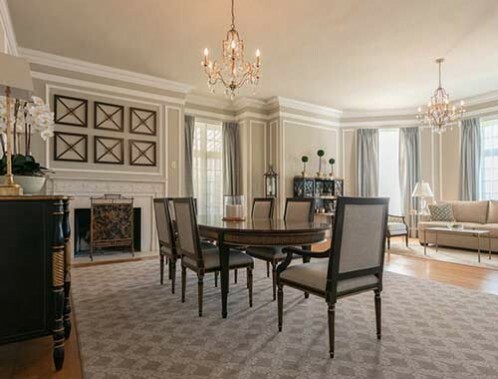 Bill’s house now reflects his status as top vampire, particularly the grand entry, his elegant office and study, and the bedroom suite he gave his charge Jessica. There are equally sordid sets, such as the tortuous detention camp set up by a group of vampire-hating humans. We also return to the whole community of Bon Temps, with new sets among the now classic…always richly layered realism with a touch of the fantastic! Photo © 2013 HBO. All Rights Reserved. This critically acclaimed series immediately established itself as stylized, artistic and beyond-the box, setting high expectations for all seasons to follow. For the third season, Coven, the design and decor team once again presented a sophisticated and carefully curated visualization. Descendants of a Salem coven have long been established in New Orleans, rivals to the local voodoo colony. The austere, gorgeous black and white world of the coven is juxtaposed to the color expansive realm of voodoo. There is also a momentary step back into the gruesome past of the Louisiana-born socialite, Marie Delphine LaLaurie, an actual 19th century serial killer. The sets of MAD MEN have become iconic beacons of mid-century design, fittingly honored with numerous Emmy nominations over the course of the series. This season holds true to the standard, but offers a new look. 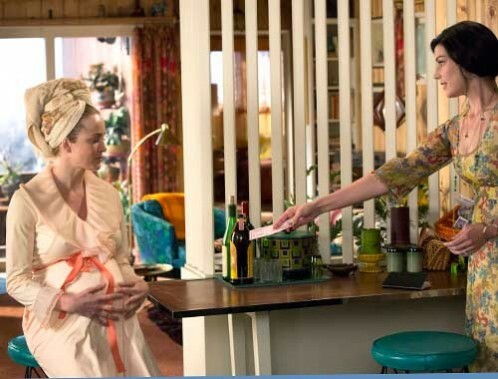 As the storyline comes into the latter part of the 1960s, the series travels to Los Angeles, where Megan Draper has a Laurel Canyon hillside bungalow, complete with macramé, Scandinavian rya pillows and rugs, yellow freestanding conical fireplace, purple iron daybed and a camel saddle stool/side table. 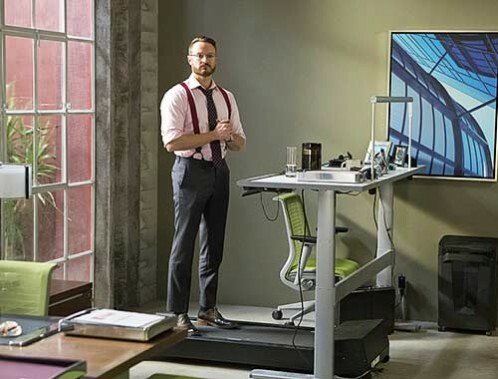 Contemporary New York office spaces still abound, as the series continues to take us through the range of design and décor of the decade. Caity Lotz, Jessica Pare. Photo by Michael Yarish © 2013 MC. All rights reserved. 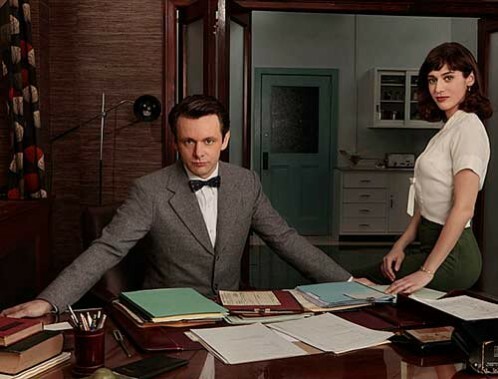 The pilot for this breakout series introduced the world of medical academia in the 1950s Midwest – not the place one would expect to find the first scientific studies of human sexuality, but in fact the actual setting of the groundbreaking research by real-life pioneers in the field, William Masters and Virginia Johnson. We meet the renowned gynecologist in his carefully appointed mid-century office set in the center of the traditional Washington University Maternity Hospital, St Louis, Missouri. The contrast in sets speaks volumes in foreshadowing the reception to his upcoming research! Photo by Craig Blankenhorn © 2013 Showtime. All rights reserved. THE BIG BANG THEORY does it again! 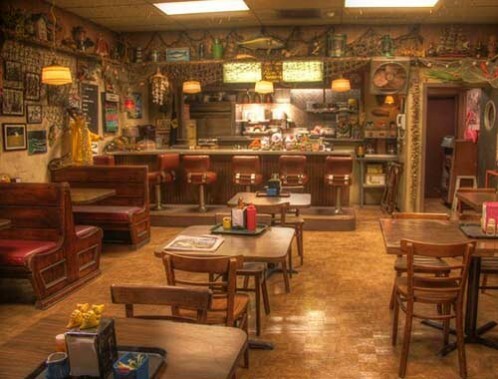 The sets for this ever-popular top-rated comedy series never fail to amaze. Every season brings more unique restaurants and bars, and at least one convention or conference, whether scientific or Comic-Con, plus innumerable fun swing sets. This season included another out-of-this world cool comic-book store as densely layered and creatively put together as the now iconic apartments, which, with careful tweaking, are as fresh and dynamic in the 7th season as they were in the first! Photo by Chris Harwood © 2013 CBS Broadcasting, Inc. All Rights Reserved. 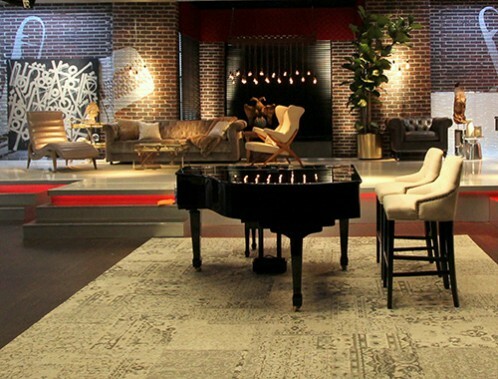 Three cutthroat businesses opened the 3rd season of HOUSE OF LIES, but the standout out was Marty Kaan’s eponymous new management consulting firm, an edgy, creative space with statement art pieces and contemporary furnishings. The edginess gets a push when the firm takes on a hip-hop fashion label, DollaHyde and produces the rollout of their new product, complete with a sneaker launch party. 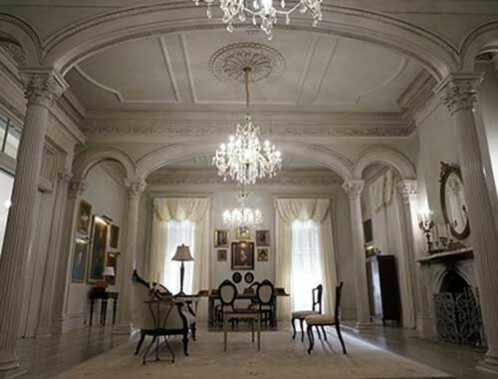 The sets reflect this season’s psychological twists, dark, no matter how bright the palette. Season 5 of this perennial favorite began and ended with Mitchell and Cameron’s wedding, from the proposal to the actual 2-episode event, with numerous stages of the planning from fun to disastrous, including a wacky wedding planner’s space, different wedding venues, the buying of their daughter’s dress, and a visit to Cam’s childhood Missouri farm. And that’s only one-third of the family! Stand-out sets include: a trip to Australia, more hot new restaurants, a closet convention, the Dunphys’ 20th anniversary at a fair, Manny’s birthday party, a dog show…and an adults-only trip to Las Vegas! Sofia Vergara, Ed O’Neill. Photo by Ronda Churchill © 2014 ABC. All rights reserved. There’s a reason this competition program is nominated year after year in the same category as major awards shows – the sets are stunning! From stage to backstage, the sets have a bold, graphic quality. Very now. Then the dial is turned to personalized mentor lounges/rehearsal rooms designed to promote equality but representing the inherent individuality of each of the four judges. 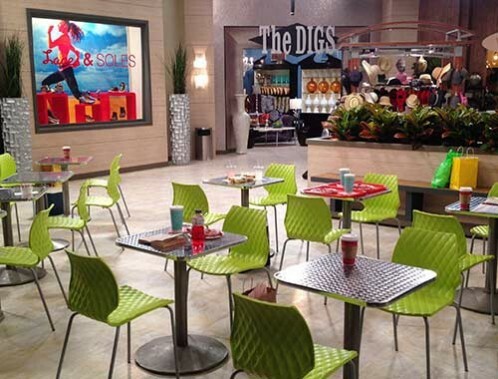 Talent is showcased through the 3 phases of the show and through each new season’s amazing sets!